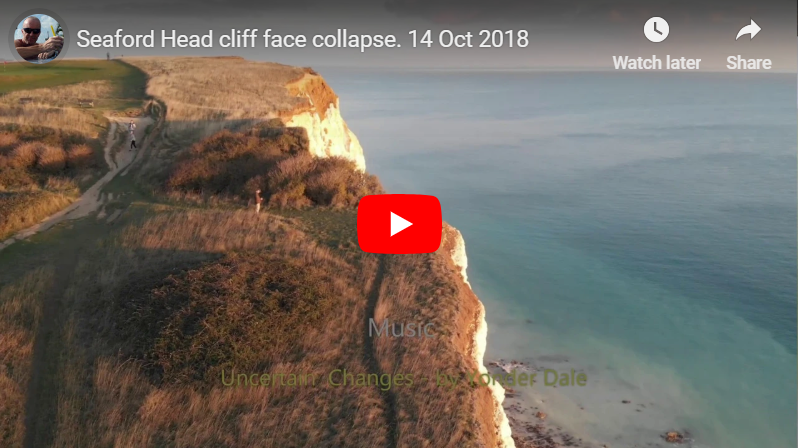 In the afternoon of Sunday 14 October 2018, a large section of the cliff face and cliff edge at Seaford Head on the coast of East Sussex collapsed into the sea. 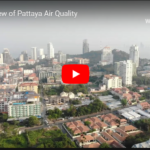 I was shooting video with my Mavic Air drone of the very area that collapsed only a few days before the event, so I revisited the cliffs after the chalk fall to make a before-and-after video. Here is the result. 5 metres of the cliff edge at the highest point, only metres from the footpath, fell away without warning and hundreds of tonnes of chalk and soil crashed to the beach 90 metres below. Fortunately, no one was hurt. It is quite chilling because the previous summer I had been sitting a couple of metres back from the edge (in other words on the part that fell off) when a young lad, who had been sitting with his mate 10-15 meters further along, and sensibly further back from the edge, took the trouble to come over to me and very politely warn me that it was probably a bit dangerous to be sitting where I was. I thought he was being a bit over-cautious and he probably thought I was either tired of life and about to jump, or just an idiot. Either way, not wanting to seem churlish, I thanked him for his advice and moved back a few feet to to sit and admire the view. I realise now that that this whole section fell 90m to the beach! It does make you think. I wonder how many years or decades it will be before the erosion takes the actual footpath, and whether the golf club will be sharing the 17th and 18th fairways with walkers?